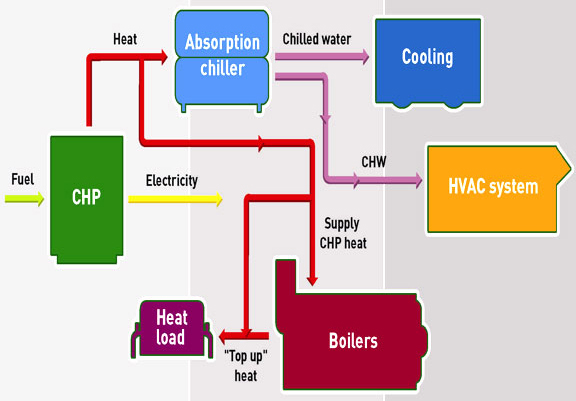 CHP, also called cogeneration is the concept of producing two forms of energy from one fuel. One of the forms of energy must always be heat and the other may be electricity or mechanical energy. It is the concurrent production of electricity or mechanical power and useful thermal energy (heating and/or cooling) from a single source of energy. In a conventional power plant, fuel is burnt in a boiler to generate high-pressure steam. This steam is used to drive a turbine, which in turn drives an alternator through a steam turbine to produce electric power. The exhaust steam is generally condensed to water which goes back to the boiler. As the low-pressure steam has a large quantum of heat, which is lost in the process of condensing, the efficiency of conventional power plants is only around 35%. In a cogeneration plant, very high efficiency levels, in the range of 75%–90%, can be reached. This is so, because the low-pressure exhaust steam coming out of the turbine is not condensed, but used for heating purposes in factories or houses. Combined heat and power can contribute to the transformation of our nation’s energy future. It can also contribute to a great extent in country’s progress. CHP offers significant, economy-wide energy efficiency improvement and emissions reductions. Our existing system of centralized electricity generation charts an unsustainable energy path, with increasing fuel consumption and carbon emissions, while continuing to squander over two-thirds of the energy contained in the fuel. At least half this wasted energy could be recaptured if we shift from centralized generation to distributed systems that cogenerate power and thermal energy. Besides saving energy and reducing emissions, distributed generation also addresses emerging congestion problems within the electricity transmission and distribution grid. CHP represents an opportunity to make significant progress toward meeting our Kyoto commitments on greenhouse gas reductions. The local air quality improvements and opportunities for economic growth presented by CHP are equally compelling. CHP presents an opportunity to improve the "bottom line" for businesses and public organizations, while also providing a path for improving the environment. The private sector also needs to take a leadership role. The primary barriers to greater CHP use are regulatory and institutional, not technical or economic. The private sector must work with government regulators and policy makers to insure that competition and incentives for innovation are preserved, while creating a favorable regulatory environment for CHP. And the private sector should actively pursue adoption of CHP — both for environmental and "bottom-line" benefits. Because combined heat and power plants optimize energy they cut fuel costs and pollution. Today we have a new found sustainable and easily available energy source to fall back on/ depend on. Environmental advantages: It significantly reduces CO2 emissions through greater energy efficiency. Promotion of competitive business practices: It increases efficiency, thereby reducing business costs. Local energy benefits: It is deployable throughout the U.S. and may be able to use locally sourced, renewable fuels (depending on the generation technology chosen). Advancing infrastructure modernization: As a distributed generation resource, it can relieve grid congestion and improve energy security. Who can have CHP solution? The customers who use Steam, Electricity, Air-conditioning and Chilling and who have access to Natural gas, Bio-gas or LPG and can utilize heat (which can be in the form of steam, hot water, oil or hot air). It can also provide electricity almost at better proportion by replacing existing PRV with its Steam Turbine-Generator sets, without disturbing the existing steam utility in process. We at S4E provide services for construction, installation and integration of CHP Plants and after sales service/ support. We create value from customers steam distribution networks through the design, manufacture and installation of Backpressure & Condensing Steam Turbine-Generator sets. Also we create value from heat for the customers who are users of natural gas or biogas using devices through design, manufacture and installation of gas engines, waste heat exchangers and absorption chilling systems. These systems represent the most efficient and cost-effective power generation technology ever invented which simultaneously save our customers money and eliminate air emissions through reduced fuel consumption. We do not just respond to your specifications, but go much beyond. We work closely with you, studying in detail your heat, steam, electrical aspect taking care of load management, steam usage patterns etc. Based on this we recommend the system that is most suited to you either our standard systems or we could make one tailor made as per your requirements. We make it our business to look into everything, from presale engineering, to commissioning and further on to post-sales technical support. We focus on results.